I have a very good friend, Terri. Her most cherished fabric is "Bohemian" one of the first fabric lines by Anna Maria Horner. Earlier in the year, she entrusted her fabric to me, to make a quilt. 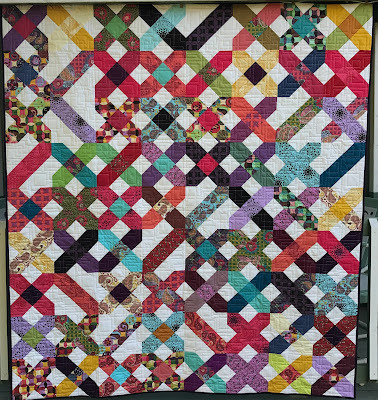 I chose to make a version of My Swedish Ex, and worked on it during the Gruber's quilt retreat in July. It was both such fun and a little stressful. As I cut into the fabric, I wondered, would Terri love what I made? Or feel that I had ruined her prized fabric? I added some solid fabric that she had sent along. Of course I did--it's why I do. :) I added a few shot cottons of my own for good measure. 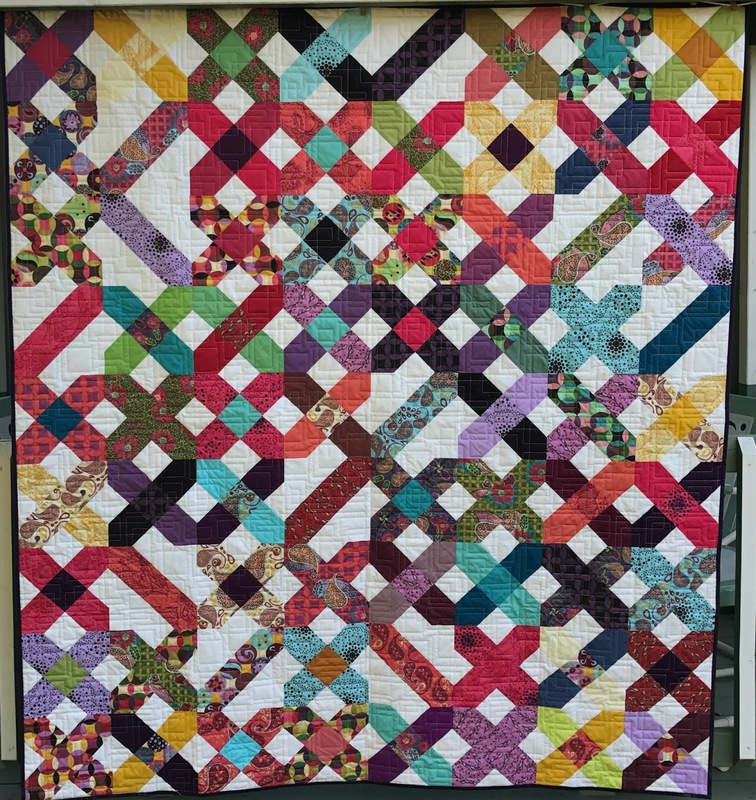 So many happy thoughts went into this quilt. That's the thing that happens when you make a quilt for someone you know--you are adding an extra part of yourself as you sew each stitch. When we met good friends Russ and Ingrid in September at the coast by Carmel, I took the quilt along for a little photo shoot. We went back to the place where we had photographed the original My Swedish Ex. It's another of my favorite pictures. I was able to add a bit of selvage into one of the blocks. This was a very special quilt. I feel I was entrusted with a treasure, both the fabric and Terri's friendship. Quilt Size: 64" x 72"
Of course she's going to love it. I love it, too! This is terrific. I am loving strolling back through past posts to read more about your work. And PS--no need to reply to all of these!